Short Style, Spiraled Stem. ca. 1850-1900. Wood. Varnished, No evidence of use, associated with object E500. E507. In many Native American religions, both past and present, the Sacred Pipe has special meaning and origins. Each part of the pipe has a special purpose and symbolic meaning. In some religious ceremonies, the purpose of the smoke is for an offering to the spirits, and inhaling the smoke allows for communication with the spirits. The stem of the pipe was pointed in the direction of the spirits and attracted them towards the ceremony. Pipes are often found in creation stories in native religions, such as the Lakota religion. In the Lakota creation story, a buffalo calf woman comes to Earth and gives the Sacred Pipe to the Lakota in order to assure health, welfare, and overall happiness of the people. After they received the pipe, the buffalo woman created the first ritual of the pipe, which was the Keeping of the Soul. This ritual was entrusted to one person, who was given the ceremonial duty of connecting with the Great Spirit through the smoke of the Sacred Pipe. 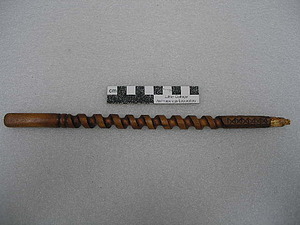 It is a prominent position to be chosen as the Keeper of the Pipe, a right only given to select people in the tribe. The buffalo woman then disappeared into the sky, leaving behind a red pipe bowl in the shape of a buffalo as well as a stem made of wood adorned with twelve eagle feathers. This became the Sacred Pipe that is the central tool of the Lakota’s religious practices. Each religious ceremony in the Lakota religion begins with a Pipe ceremony. Elbow Style Bowl. ca. 1850-1900. Catlinite with wooden peg. One piece instead of two, may suggest a tourist piece or non-sacred. E509. One of the main symbols for Christianity is the cross, but for many Native Americans religions the symbol of their religion is the pipe. Even today, these religions, now practicing a hybrid of native religion and Christianity, use a pipe to symbolize their religion. The pipe symbolizes the transitional periods, such as the movement onto reservations, in the history of Native Americans. It also represents the preserving of their culture and religious traditions. 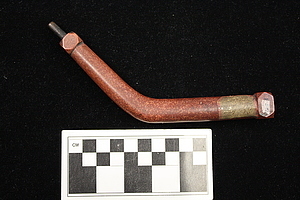 The pipe was present and plays a large part in the creation of numerous native religions. Today, there is frequent use of both the cross and the pipe to embody the native religions and culture. An interpretive display by Ally Lothary ('16), exhibited on the second floor of Koren in 2015.